Burt Alvord (1867-after 1910), or Albert Alvord, was a lawman and later outlaw of the Old West. 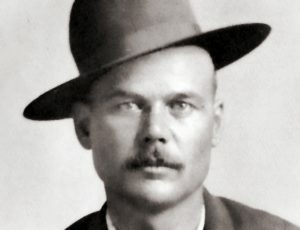 He began working as a deputy under Cochise County Sheriff John Slaughter in 1886, but he turned to train robbery about the beginning of the 20th century and escaped to Central America, where he was last seen about 1910. Burt Alvord. Photo courtesy of Wikimedia. Burt Alvord was a big, strapping, swarthy-looking char­acter with a bald pate and an I.Q. that was said to be considerably less than his age, which was about 30 at the time. Alvord did have a few positive attributes. He was usually cheerful, had a sense of humor and was a mighty popular fellow in Cochise County during the 1890s. He’d been a deputy for county sheriff John Slaughter, who’d pronounced him abso­lutely fearless. Burt was also pretty good with a six-shooter. Old timers said he demonstrated his prowess at beer bottles hung from a tree limb by a string. He’d shoot the string with his right hand, then draw with the left and break the bottle before it hit the ground. 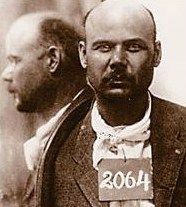 Burt Alvord, Yuma Prison Photo 1904. Photo courtesy of Wikimedia. His major interests seem to have been poker, pool, horses, guns and practical jokes. Naturally, the locals thought the pair had been killed in a gunfight. Kind words were said about the boys and a large delegation gathered to meet the stage. Burt wasn’t opposed to a little larceny either. One time he and a little Irishman, Biddy Doyle, staged a fixed wrestling match in Bisbee. They recruited a muscular miner who was willing to take a fall for a reasonable fee. The only soft piece of ground suitable for the event was the manure pile outside the Copper Queen Mine. In physical appearance, Biddy was a David facing the Goliath of the hardrock bunch. The odds rose to about 20 to 1 in favor of the miner. Burt and Biddy stood to make a handsome profit in the outcome. Things might have gone better if the pair had rehearsed the match and not made the fix so obvious. However, early in the first round, Biddy rolled on top of the miner and shoved his face down into the manure. The big guy called it quits amidst a roaring outcry from the crowd who figured they’d been had. During the confusion, Burt and Biddy somehow managed to grab the money and hightailed it for Tombstone. Burt was as good with his fists as he was with a six-gun, something that inspired the city fathers in the new rough and tumble town of Pearce to hire him as constable. In no time, he’d pacified the two-fisted miners. When things got out of hand at the rollicking cowtown of Willcox, Burt was called in to tame the town. Again; he was up to the task. I reckon things were getting too easy for the good natured constable and he felt a need to broaden his dimensions. That’s when he decided to go into the lucrative business of robbing trains. He could use his job as a peace officer to screen these nefarious activities and no one would suspect. Besides he was too well-liked by the local citizenry to be accused of a crime. Also, it might be added, no one figured him to be smart enough to pull off a robbery and get away with it. Alvord rounded up a few cronies to assist in these endeavors. He’d plan the crimes and establish alibis while they’d execute them. They became known as the Alvord-Stiles Gang. The gang included a pugnacious kid named Billy Stiles; Bill Downing, a surly ne’er-do-well; Matt Burts, a not-too-bright cowboy; Bravo Juan Yoas and Three-Finger Jack Dunlap, a pair of saddle bums who’d do anything for money except work. The first robbery took place at Cochise Station on the evening of September 11, 1899. The take has been estimated as high as $30,000 in gold. Alvord’s alibi was cleverly planned. He, Matt Burts, Stiles and Downing were playing poker in the back room of Schwertner’s Saloon when the robbery occurred. Every few minutes, a porter would carry a round of drinks into the room and then emerge with a tray of empty glasses and announce to the local imbibers that Burt and the boys were having a serious game of poker behind those closed doors. Meanwhile, Alvord and his pals exited a side window slipping into the darkness. Stiles and Matt headed towards Cochise Station while Alvord and Downing waited outside Willcox for their return. When the pair returned with loot in hand, they all returned to the saloon, re-entered through the side window and resumed their game. When word of the robbery reached Willcox, someone suggested they notify Constable Burt Alvord, who was in­volved in a poker game at Schwertner’s Saloon. Burt was noticeably shocked upon learning that the Southern Pacific had been held up. He immediately deputized his poker-partners and off they rode. Naturally, the trail was lost on the outskirts of Willcox. Just to make sure the boys didn’t start squandering their new wealth around town and arouse suspicion, Burt took the gold to a secret hiding place and buried it. He was feeling pretty good about his perfectly executed train robbery and the alibi he’d established. It sure looked like good ol’ Burt had planned and executed the perfect crime. However, Alvord didn’t count on the persistence of Wells Fargo detectives and a suspicious lawman named Bert Grover. Grover suspected the constable of Willcox early on— perhaps he acted a little too innocent. Grover cajoled the porter at the saloon into confessing to his role in establishing Burt’s alibi. But, before he could bring charges, his star witness got cold feet and left the territory. Having no other witnesses, investigators could only hope for a break in the case. Meanwhile, Burt was feeling so confident about his debut as a mastermind of crime, he decided to plan another. This time he let Bravo Juan, Three-Finger Jack, Bob Brown and the Owens brothers do the dirty work. The daring robbery took place at the train station at Fairbank on the evening of February 15, 1900. This time something went awry. The outlaws didn’t figure on the legendary Jeff Milton being in the express car. Posing as drunken cowboys, the five bandits opened fire on Milton as he stood in the open door of the car as it pulled into the station. Seriously wounded, Milton fell back inside. The experienced old gunfighter had the natural instinct to grab his trusty Wells Fargo shotgun as he dropped. The five desperados charged through the door just as Milton rose and cut loose with his ten-gauge. Bravo Juan saw it coming and turned his backside just in time. He caught a load of doubleought shot in the seat of the pants. He lit out on the run and didn’t stop until he hit the Mexican border. Three-Finger Jack wasn’t as lucky. He was hit full force. The outlaws went away empty-handed, that is, if you don’t count the Wells Fargo lead two of ’em were carrying. Three-Finger Jack was mortally wounded; and a few miles from Fairbank, his compadres left him beside the trail to die. Back at Fairbank, a posse was organized. Trackers easily picked up the bloody trail leading to where Dunlap lay. Needless to say, the dying outlaw was much-chagrined at being left behind by his cronies and was only too willing to give testimony, not only for the details surrounding the Fairbank robbery, but the one at Cochise Station as well. As a result of Three-Finger Jack’s confession, Wells Fargo got the break they needed to crack the case and the citizens of Willcox had to find a new constable. Burt Alvord eventually did his time at the Yuma Territorial Prison. Incidentally, the recovery of the loot remains a mystery. Old timers around Willcox said that after Burt was released, he came back to town to say, “Howdy,” to his old friends, then left for Central America where he bought a large cattle ranch. Who grub­staked him? Quien sabe? Although one can’t help but wonder if he might have stamped a WF brand on the hides of those critters in honor of his unwilling benefactors. After all, Burt did have a grand sense of humor! Excerpt from Arizoniana by Marshall Trimble, the state’s official historian.